All press material detailed here can be reproduced. Many thanks to Jacquie Wise for interviewing us on her Southern FM radio program on 3SCBFM 88.3. For more info about Jacquie and her work see Wise Ways for life, love, work and soul with Jacquie Wise. Warburton, a pristine river town in the Upper Yarra Valley, will host first-time event ‘Transforming Writers’ this March. With a focus on writing and expression that supports personal and social change and development, and an emphasis on community, interdependence and collaboration, this series of weekend workshops will appeal to anyone interested in enhancing their own writing and storytelling skills for both personal and professional development. Participants will be of varied backgrounds and experiences and no writing experience is required. International best-selling author Dr Lewis Mehl-Madrona PhD will be offering a full day workshop entitled ‘Liberating the story’ (with introductory lecture the evening prior). He will guide participants into the inherent storytelling at the heart of life, of writing and of expression, and explore the ways in which personal story and meaning can be captured on the page with richness in daily life. His unique approach bridges Western medicine and Indigenous wisdom. The program will also showcase several international and local expressive artists and writers continuing the theme of storytelling. Participants will have the opportunity to experience new and dynamic storytelling approaches using a variety of media. The art of oration, writing for performance in song, drawing on the mystery of inner process and shared storytelling in a community setting are workshop topics that promise an immersive and fulfilling experience for all those who attend. Presenters Maya Ward, Simon Oats, Keith Simons and Murray Goodchild are all residents of Warburton whose work boasts national and international presence. ‘Tickets are priced from $20 to be affordable and accessible to everyone and multiple events can been selected to tailor-make personal packages at discounted rates,’ says co-founder Keith Simons. A website at www.transformingwriters.com.au and Facebook page provide further information and updates. Transforming Writers Inc is a not-for-profit community group founded by Keith Simons and Lindy Schneider. This event is proudly supported by the Upper Yarra Community Enterprise and the Upper Yarra Arts Centre. 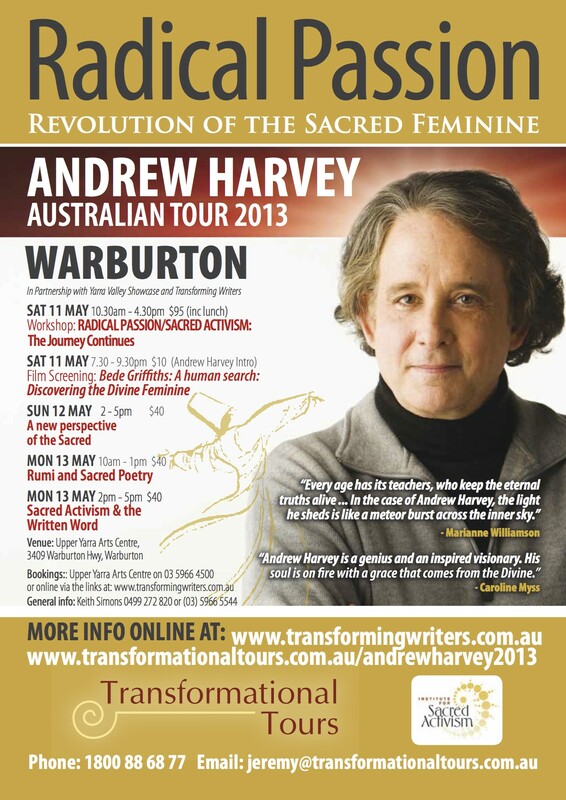 A follow up event is scheduled for 11-14 May this year featuring guest author, mystic and scholar Andrew Harvey who returns to Warburton with his inspiring work on Sacred Activism. Interviews with Lindy Schneider and Keith Simons are available on request. Interviews can also be arranged with Dr Lewis Mehl-Madrona, Dr Rocky Crocker, Maya Ward, Simon Oats and Murray Goodchild. Dr Lewis Mehl-Madrona, MD is an author and healer trained in family medicine, psychiatry and clinical psychology whose interests include the furthering of a paradigm shift within medicine, psychiatry, and psychology toward aligning with indigenous knowledge systems and healing activities in line with what traditional cultures have offered. Maya Ward is a Warburton poet and writer who works in community, corporate, arts and environmental settings as an artist and educator. Her memoir The Comfort of Water: A River Pilgrimage was shortlisted by the State Library for the 2012 Year of Reading. Simon Oats is an acclaimed storyteller, musician, actor and teacher and a graduate of the Victorian College of the Arts. His most recent storytelling show “Orpheus in the Underworld” has been acclaimed by audiences and critics alike. He is the author of Storytelling for Intercultural Connections – A Handbook for Australian Schools. Murray Goodchild is a singer/songwriter, workshop facilitator and a therapist of Chinese Medicine and acupuncture. Murray runs Body-based storytelling workshops, builds instruments and is recording his second album of original songs. Keith Simons has been a student and teacher of spirituality, psychology, philosophy, mythology, culture and art for thirty-five years. He synthesises what he has learnt and explores ways in which writing and speech/performance can be used as a transformational process. Through the power of his own life story, Lewis will take the listener on an epic journey that both illustrates the healing power of story and provides deeper insights in to the challenges and the turning points that he has faced as he has integrated his passion for medicine, healing and storymaking with his indigenous heritage. This workshop is an invitation to explore the deeper aspects of personal story making against a backdrop of the art and evolution of storytelling as a craft and healing tool, with particular reference to Indigenous cultures and Native American traditions. Explore a deeper connection between your story and the grand story motifs of lived experience. Explore the relevance of musical themes in writing including rhythm, spaces, the in and the out breath and efficiency of phrasing. Song and dance invite the participant’s immersion in an experience, supporting reading and writing as a whole body experience, engaging all the senses. Explore how to cultivate a writing practice of depth, and produce writing that can heal, open and transform both yourself and your readers. Inspired by Buddhism and the poetic traditions, we will explore techniques and processes that can open us to inspiration. Drawing on the craft of oral storytelling we will explore structural and dynamic tools and techniques that can be applied to a range of different mediums to maximise audience engagement and emotional impact. The tools and techniques will be of great benefit for writing fiction and non-fiction, script-writing, public speaking, song writing and film making. Exploring various ways to bring forth inspired and transformational writing and story telling. An interactive workshop using meditation, active imagination and Hocokah (sacred talking circle) to tap into and express trans-dimensionally. Storytelling is a way to liberate the inner stories that can transform consciousness. speaking, song writing and film making. Logos and headshots available on request. Above links are live. Book your place - events filling fast.